The Short Version: While God may want all married, or soon-to-be married, Christians to stay happily together, many couples encounter troubles along the way. And when issues arise, those couples are often unsure about where to turn and how their situation fits into God’s plan for them. 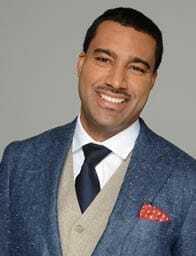 Enter Psychologist and Minister Dr. Alduan Tartt, who provides men and women with the tools they need to resolve conflict, help each other grow, and make each other feel special. He combines his practical therapeutic training with teachings from scripture to repair marriages and relationships all over the globe. We’re not all born with the skills it takes to keep a relationship or marriage going strong for decades. In fact, many good-hearted people come from families with parents who didn’t provide the best example of a healthy marriage, and learning the skills needed to make love last can be complicated — especially when it’s on-the-fly as newlyweds. 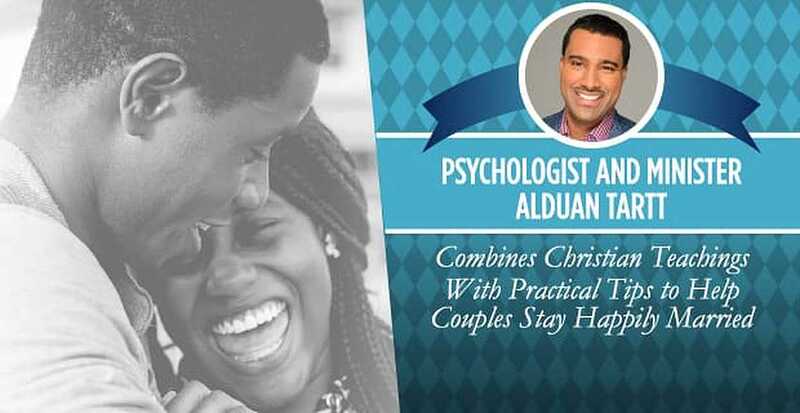 Dr. Alduan Tartt assists married couples with his trademark mix of therapy and faith. Success in the first years of marriage is vital to a couple’s long-term prospects. One study tracked newlyweds during the first two years of their marriage, then checked back with those who were still together 13 years later. Researchers discovered that disillusionment, including a decline in overt affection and a feeling of increased ambivalence, during the early years was a clear sign of peril to come. While many factors contribute to relationship struggles, a common issue is that the couple never had the tools they needed to fix their married dynamic from the start. Christian couples may even turn to the church and work to repair the foundation of faith for their relationship, but, often, that’s not enough. Throw in a child and other day-to-day responsibilities to keep up a household, and it’s no surprise that the divorce rate is so high. Psychologist and Ordained Minister Dr. Alduan Tartt is hoping to change that. He created the Fix My Marriage system, which provides couples with the tools they need to keep their families together — using their faith as a guide. Dr. Tartt helps those lost in their relationships find their way back through both his extensive training in psychology and his relationship with the Lord. Dr. Tartt has talked to countless couples on the brink of divorce, as well as those working through other life challenges, during his 20 years as a licensed psychologist. He began to notice a trend with those who were struggling to keep their marriages together: None of them had had in-depth premarital counseling that gave them the tools they needed to keep their love strong. Even Christian couples, who are typically required to attend a session with a minister before getting married in a church, often just sat through a single meeting with a book on marriage and a Bible. It wasn’t enough. As both a psychologist and minister, Dr. Tartt infuses spirituality into his work. So, a few years ago, Dr. Tartt decided to combine the two schools of thought by becoming a licensed and ordained minister with the goal of reducing the trend of rising divorce rates. While seeing patients at his office in Atlanta, he also created an online package that helps couples around the world. The Fix My Marriage system is an online video course that Dr. Tartt offers to couples who are experiencing marital problems — and he understands that’s the majority of couples, especially those who are parents. In fact, Dr. Tartt said that 67% of couples report a decline in marital satisfaction after having kids. It is also fairly common that one of the partners — typically breastfeeding mothers — experience a drop in libido, he said. The course goes on to discuss strategies for couples to unify and strengthen their bonds. It all starts with presence and communication. Dr. Tartt’s treatment models are broken down in a way that makes it easy for couples to understand and use. He also offers therapy sessions online and in person. “I’m taking it from the psychology books that are written for other psychologists and teaching it to the general public. This is how we fix marriages,” he said. While his work is geared toward Christians, people of any background can benefit, he added. He especially finds joy in connecting couples whose relationship struggles are exacerbated by the fact that one person is overseas, perhaps deployed in the military. Still, Dr. Tartt knows there’s much more work to be done, and his goal is to help as many people as he can. To help achieve his goal, he’s reaching out to congregations and churches to spread the word about the skills people need to maintain happy, healthy Christian marriages. He’s also working with newly engaged couples and those who are seriously dating. Dr. Tartt and his wife are planning to hold a series of workshops targeting what he calls “pre-married” couples. “We want to teach them how to relate to each other before they get married, in the most intense way possible, so they can avoid the mistakes and be better equipped for how difficult modern-day marriage is,” he said.